Skill building has taken centre stage what with India’s conundrum around jobs, employment and wages. Often overlooked is the significance of robust data on various skilling metrics or skill indicators without which all good intent is akin to a wild shot in the dark. An acute paucity of credible and quality data stands in the way of harnessing the benefits of apprenticeships and impedes efficacious decision making. We welcome the timeliness and relevance of this report in the context of strong recent advocacy for apprenticeships in India as a bellwether of skilling youth towards higher employability and meaningful careers. 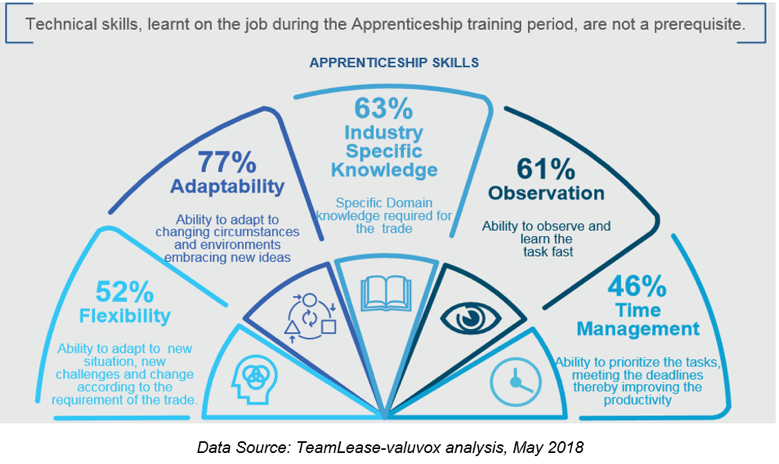 The promise of apprenticeships to fill a looming skills gap can only come to fruition if decision-making shifts from perceptions and back of the envelope estimates to facts backed by strong data. Sadly, the vocational route in India is often undervalued as a second-rate low-paying profession for the ‘less academically inclined’ devoid of the prestige of traditional education. But is that really the case? Far from it, as hard data reveals. The most salient finding which gives apprenticeships a prodigious shot in the arm – as it stands, apprenticeship stipends command a significant premium over minimum wages. Get this, around 41% higher than stipulated minimum wages in a majority of sectors and cities. 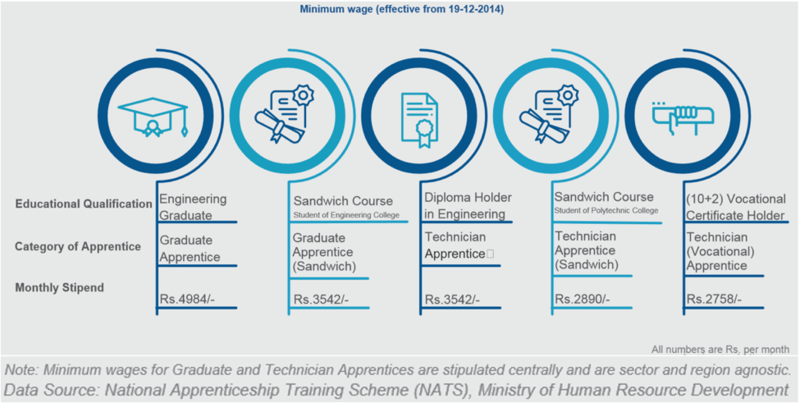 Stipend payout data to apprentices by employers was analyzed under government programmes such as the National Apprenticeship Promotion Scheme- under the Apprentice Act- and Other Employability Enhancement Schemes (OEES) such as those run by NETAP. Both in manufacturing and services, monthly stipend payouts are in the average range of Rs. 9,000 – Rs. 10,000. In all sectors and qualifications, OEES median stipends for top roles outstrip market (Apprentice Act) median stipends by 7.66%. Technical graduates fare 23% higher in market stipends under the Act compared to their non-technical counterparts. Similarly, OEES technical graduates get higher stipends in 6 of the 9 cities covered by the study. Overall, there exists a propensity for 12%-22% higher stipends for higher educational qualifications compared to the next immediate lower qualification rung. Postgraduates and engineering graduates attract higher pay under both OEES and the Act with 20% higher pay for both groups of students in manufacturing jobs and modestly higher at 2% in the services sector. 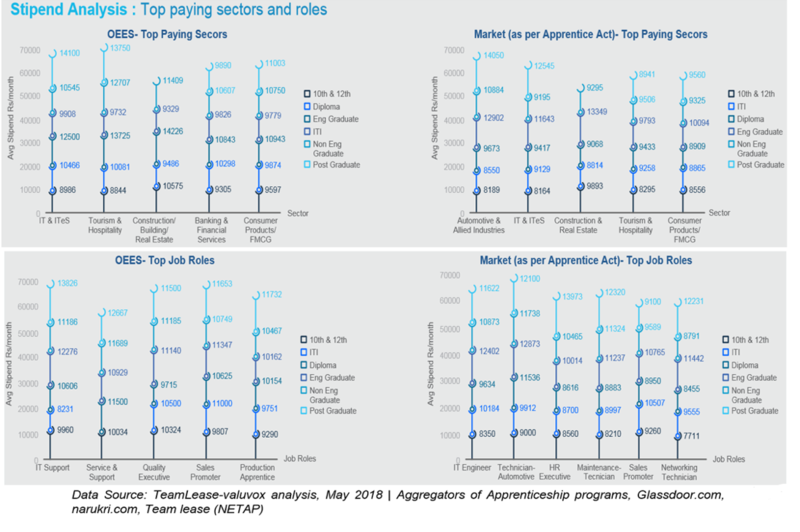 Interestingly, and against established norm, in three major cities both Act and NETAP/OEES diploma-holder apprentices receive 2.5 times higher pay than minimum wages. The employability of ITI graduates have become a major talking point in recent times. Although other reports[ii] have found an alarming 30% decline in the employability of ITI pass-outs between 2017-2018, ITI graduates continue to receive 11% higher pay than 10th or 12th pass-outs, slightly edging past even diploma holders with a 4% higher pay. Domain knowledge and analytical abilities take the top 3 spots in an employer’s skills wish-list in specialised domains such as IT, Finance; attracting stipend premiums of a minimum of 21%-39%. Conversely, soft skills are highly ranked in support functions such as Administration, HR. In pre-apprenticeship scenarios, 46%-77% of employer respondents of the survey seek essential soft skills from candidates. We find this is in line with general hiring trends. The India Skills Report 2018[iii] similarly found ‘adaptability and positive attitude’ in the top 3 skills required by companies alongside domain knowledge. Suggestive of a chasm, the report found significant variations of 29%-71% between candidate stipend expectation and market pay-out in the top 5 metro cities, with a pan-India median stipend expectation of Rs. 12,100/month. 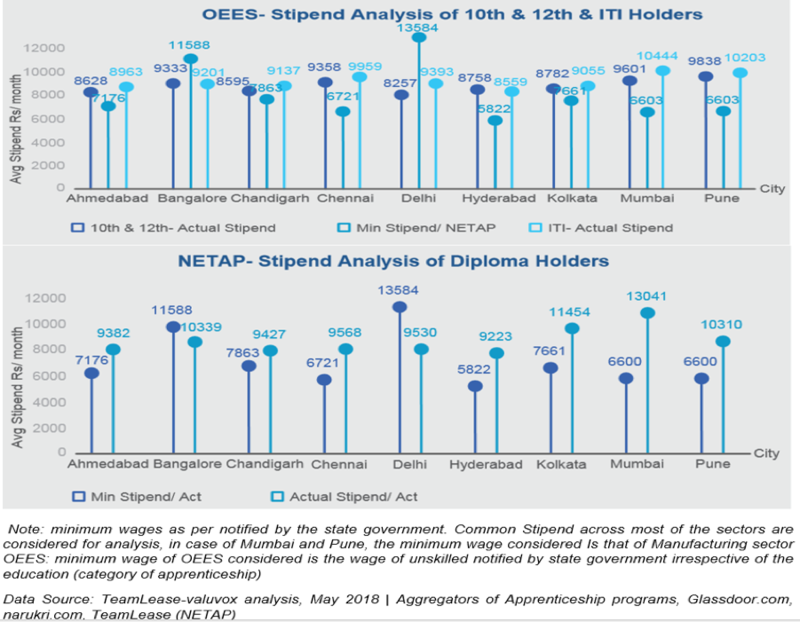 Although stipend expectations in Delhi and Bangalore are among the highest, NETAP stipends for 10th & 12th pass-outs and Diploma holders in those cities are well below the minimum wage. The report does not qualify the reasons and we can expect more clarification in subsequent editions. In Part II we examine other metrics such as apprentice engagement and mobility.